a few days ago a friend shared a letter her brother wrote to his grandchildren. the letter is his first hand account of traveling from connecticut to washington in order to attend president obama's inauguration. I found lb's account so touching and profound I asked if I could post the letter on the mouse. permission was granted. I hope you find papa's letter as moving and enjoyable as I. 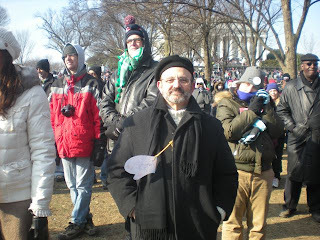 Lots of people have asked me about my trip to Washington, D.C. to be at President Obama’s inauguration. And I want to tell them about it, but most of all I want to tell you. All of us that are grown up understand and appreciate the history that has been made by electing the first African-American president. It gives us all hope for the future that we haven’t felt for a very long time. But even if only some of our hope and dreams come true, it is all of you that will benefit the most. You will grow up watching the president’s two children, Malia age 10 and Sasha age 7, grow up with you. You will see how their parents, each with very difficult jobs, will always make sure they know that they are loved and important. It is because they are so important that I know that Mr. and Mrs. Obama will do everything they can to make a better world for them and all of our children. So, let’s get to the story. I wanted to go to the inauguration but I might not have if it wasn’t for a telephone call I got late at night from C who lives just outside of Washington. She told me that she could get us tickets to one of the inaugural balls and that I could stay with her if I wanted. I didn’t think about it twice, I said yes. All I needed were train tickets and a tuxedo and I would be on my way. I left on the train from New Haven at 9:00 Monday morning, the day before the inaugural. I brought a book to read on the long six hour ride. I did read some, but I also talked and listen to the other people on the train. You see, the train was absolutely 100% full and everyone was going to the same place for the same reasons. So we talked and laughed and shared stories. We were like a big family travelling to a reunion. The train station in Washington was just like the packed train. There were so many people moving shoulder to shoulder and trying to find a way to get where they wanted to go. Some needed taxis, some wanted the Metro (subway) and others just looked confused. If you were rushing too much you might have missed that something unusual was happening – no one was irritable, no one was pushing to get by. I’m not sure I can do a good job of explaining the mood of the crowd, except to say is was something I would experience among all of the crowds I came in contact with for the next two days. Picture Uncle Denny hours after the Pittsburgh Steelers win the Super Bowl. The incredible excitement and joy has passed and he is sitting back on his couch and smiling. The combination of happiness, contentment and satisfaction is the best I can do. I took the Metro to meet C where she works in Arlington which is just across the river from Washington and together we drove to her house just a few miles away. Later we met her boyfriend in Georgetown, a neighborhood in Washington, and had a great diner at a restaurant named Clyde’s. The next morning I left for the inaugural around 10:00 with C and her roommate. The City of Washington was closed to automobiles so we took the Metro. We barely fit on the train. Everyone was stuffed together, but everyone was either smiling or were hiding a smile just behind their lips. Again, I saw that incredible mood of the crowd. We got off the train with everyone else maybe a mile or so from the Lincoln Memorial. We met up with C’s boyfriend and our plan was to watch the inaugural somewhere between the Lincoln and Washington Memorials. Closer is only good if you can actually see with your own two eyes the swearing-in of the president. With millions of people there including many who had gotten there at dawn, we knew that wasn’t going to happen. Besides, I just wanted to be among the crowd on the same ground and in the same place where so much history had been made. Here, where almost a half century before Dr. Martin Luther King made his “I Have a Dream” speech to 250,000 people that had marched with him to Washington. So there we stood in front of an enormous television with even bigger speakers and watched and listened to what was happening at the Capitol building. Even before the ceremony began the crowd yelled each time the camera caught a glimpse of Barack, Michelle or the children. I won’t describe the swearing-in ceremony since I’m sure you saw it for yourself. What I will tell you is that the emotions of all the people around us were on display. Families hugged, children sat on shoulders and tears of happiness were shed, including more than a few from Papa. We hung on every word and didn’t leave when it was over. No one wanted to leave. Everyone wanted to feel the way they felt at that moment forever. If only we could. Leaving was slow and very, very peaceful. If someone caught your eye there were smiles and words such as “Isn’t this amazing”. When I smiled at a woman walking beside me she said, “I never thought I would be back to this place again in my life. The last time I was here Dr. King was talking about his dream”. There were many other such moments. There were no strangers in that crowd. I haven’t said that it was freezing cold out there because if you watched the ceremony you saw and heard about how cold it was. Even though it was cold, we decided not to take the Metro and instead we walked probably two or three miles to C’s office where her car was parked. We walked with lots of other people on highways that had been closed to traffic. As a Stephen King fan, it looked like a scene from The Stand. We stopped at a pub, ate stew and drank Guinness to get warm before leaving for home to get ready. We were going to the New Jersey Garden State Ball later that evening. We had heard some stories about how disappointed many people had been when they attended presidential balls in the past. We had recent experience to think about because C’s roomate and her friend had gone to the Illinois Ball the previous night. They waited three hours outside in the cold before they got in. But our experience at the New Jersey Ball turned out to be fabulous. There was no waiting, the food was great, the band was great and we danced and sang the night away. The president didn’t come to our ball but he did go to ten other balls. I’m not sure of the exact number, but I believe there were between twenty and thirty presidential balls that night. We stayed out late and slept late. The next morning we went out for a big breakfast and afterwards C and her boyfriend drove me to the train station. I looked forward to the long train ride home to relax and enjoy the memories of the last two days. But like the train ride to Washington, the train home was also 100% full of people that had gone to the inaugural. Sharing stories and hopes for the future made the ride home a continuation of the spirit that I felt from the start of my journey. I thought my story would end there, but it didn’t. The taxi driver that drove me to my house asked me if I was returning from the inaugural. In that fifteen minute ride home two grown men shared our hopes and dreams as if we were brothers. And the next day, before going to work, I had to make a stop at a medical building. When I was leaving a very elderly and frail woman using a walker was ahead of me at the door. Her middle-age son was behind her giving her additional support. I moved to help with the door when a young man in a Yankee baseball jacket that was coming into the building opened and held the door. As the woman moved slowly through the opened door I heard the son say softly to himself, “Maybe things can change”. And with an equally soft voice the young man said, “Yes we can”. Heh, heh! I'll be willing to bet this was the best-documented Inauguration in US history. So many people have so much time, energy, and resources invested in this working, and the Inauguration festivities were the celebration party for all that hard work, not only the hard work to get BHO elected but also the future hard work needed to get the country back on track. Your saga as reported here on the blog, and now your friend's story, are a drop in a large ocean of Inauguration reminiscences. This has become one of our quintessential American "were you there?" events, like the 1963 March, or the 1970 War Moratorium, or Woodstock. 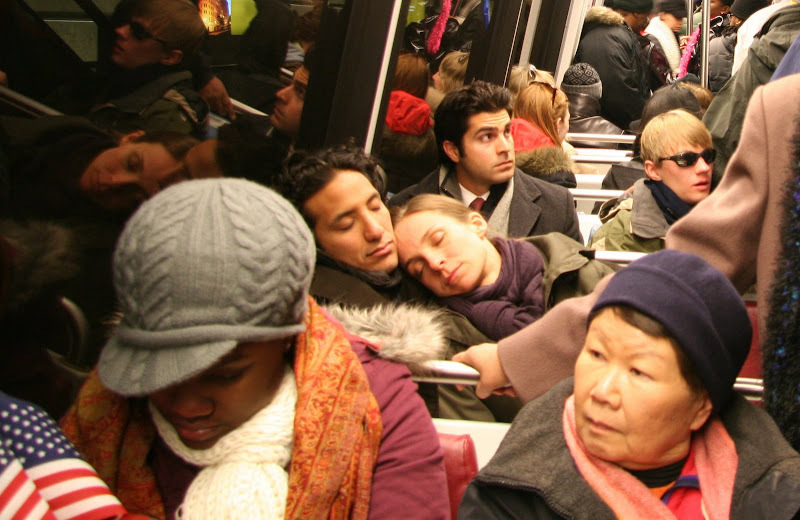 BTW, that shot of the crowd on the Metro is fantastic. Good work! What a lovely letter! It really moved me! I also love your photo on the metro, captures a bit of everything about that day. No other words than 'beautiful! ', Mousie. The beauty of this. The power of shared emotions of "happiness, contentment and satisfaction" as the letter writer puts it. "There were no strangers in that crowd." To many more such moments - be they with millions together, or just a 'stranger' holding a door open for someone else. His children and grandchildren will have a first hand account of a particularly historic event. It will be a treasure. Fantastic shot in the Metro. Wow. Thank you. And the letter is fabulous, too. Roy is right - this inauguration was fully documented like no other in history. Seems fitting, doesn't it? Thank you so much for the happy tears and the unexpected epiphany that I will be blogging about soon called Shared Vision. What a wonderful letter! Thank you for posting it. I watched the inauguration from England with my English husband and our youngest son (our eldest is at university). We were all mesmerized by the beautiful ceremony and the powerful speech that President Obama made. What a magnificent man he is - and what a great leader for the USA and a shining example to the world. I still feel like pinching myself after watching the event. It feels like it's too fantastic to have happened, but it did! I am so very proud to be American! That day defined the word JUBILATION for me. Oh, that's lovely. So glad he allowed you to share it with us. Thank you so much for posting that; it was very moving. Thank you for posting this marvellous letter. I, watched the event in Spain and like everyone here was moved. This document will be a treasure to those children and the generations to follow. Brought a lump to my throat! I'm a complete idealist and thats what keeps me disappointed a fair amount of the time. Fabulous post, and that last photo is really beautiful. lovely lighting, so atmospheric. How uplifting. It's truly a time of hope when things couldn't get much worse. It's that collective "Yes we can" that will make the difference, I'm convinced. thanks for all the wonderful comments and I'm happy to read folks enjoyed papa lb's letter as much as I did. roy, I heard some pundit refer to obama's inauguration as a washington woodstock! distracted - jubilation is the word!! That is a great letter, and I hope his grandchildren, and all our grandchildren, appreciate and value the historical Inauguration that we have all witnessed. Those of us at home watching on TV could "see, feel, experience" the tears, that energy, the emotions, surrounding the Obama Concert, the Inauguration, and all the events. Incredible...an incredible time in our history, and a time of optimism. I loved the comment: "there were no strangers in that crowd."